Besides shopping in Chatuchak Market, Platinum Fashion Mall, Pratunam Market in Bangkok, PassportChop also had the opportunity to check out an unusual market just 75km southwest of Bangkok in the city of Maeklong district in Samut Songkram province. It is perhaps one of the most photographed market outside of Bangkok – the famous and interesting and sometimes exciting Maeklong Railway Market. It is known as Talad Rom Hoop in Thai – which roughly translates to Talad=market, Rom=awning or umbrella, and Hoop=pulling down. You might think that it is quite a weird literal translation but you will see why it is known as a Market-Awning-Pulling Down market in this blog post. For most of the time, Maeklong Railway Market looks pretty much like any other street market that caters primarily to the locals – you are unlikely to get fashionable clothes and accessories. 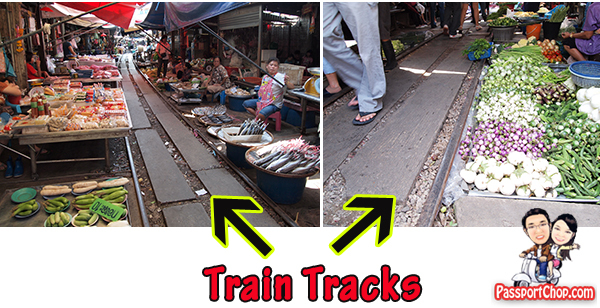 However if for some reason, you are doing marketing – the type where you go to the market to buy vegetables, meat for dinner, the Maeklong Railway Market is a good place for fresh vegetables and even sardines. Notice the circular dim-sum basket-lookalike with 2 fishes inside in the picture below – those are sardines (packed just like sardines!). The Maeklong Railway Market is quite a busy market – with locals shopping for their groceries and tourists roaming around the market waiting for “excitement” to happen. The market is sheltered by low-hanging awnings/umbrellas and if you look closely, you are actually walking on train rails. The vegetables and fruits are all placed very near these rails. In the afternoon, the train passes by the market 3-4 times. The train arrives at 1430hrs from Ban Laem and departs from Maeklong (Samut Songkram) Railway Station at 1530hrs. The next train arrives at 1740hrs from Ban Laem and may or may not depart from Maeklong (Samut Songkram) Railway Station. Do note that the train schedule is subject to change so check the schedules with the train station before planning your journey to Maeklong. 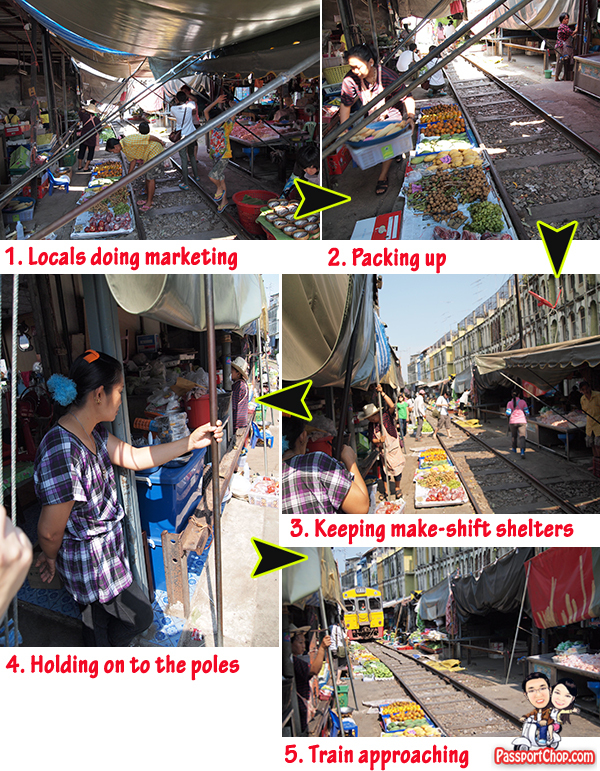 The action at Maeklong Railway Market begins just about 4-5 minutes before the train is due to pass by the market. One moment, you might see the locals shopping for their vegetables and the next moment, some vendors will begin packing their boxes of vegetables/meats and just as the siren (signalling the train is coming), the market comes alive with the vendors keeping their low-lying awnings, umbrellas – practically anything that lies over the train tracks. Then the market comes to a standstill as all the vendors hold on to the poles supporting their awnings; the keeping of the awnings is a very quick process – they seemed to have a very well-established Standard Operating Procedure (SOP) and most of the poles slide easily (with wheels) to the side. The only people moving about are the tourists and the photography enthusiasts as they planned the perfect angle to capture the train’s arrival into the Maeklong Railway Market. The train then moves slowly and passed over the leftover items on the tracks and this is also the time you hear lots of clicks (from the 20-30+ DSLRs clicking away). Once the train is gone, the vendors push back the stalls and awnings into position and resume its business again as if nothing has happened – nobody gets excited or annoyed by it, after all the market has been here for generations way before when the railway was set up in 1905. For those planning a trip down to Maeklong from Bangkok to Maeklong, note that the journey involves two train trips, punctuated by a ferry ride. From Bangkok the train departs from Wong Wian Yai station. The nearest BTS Station is Wangwan Yai (20 minutes walk). From here you get the train to the end of the line at Mahachai. You now catch the ferry across the river to Ban Laem. 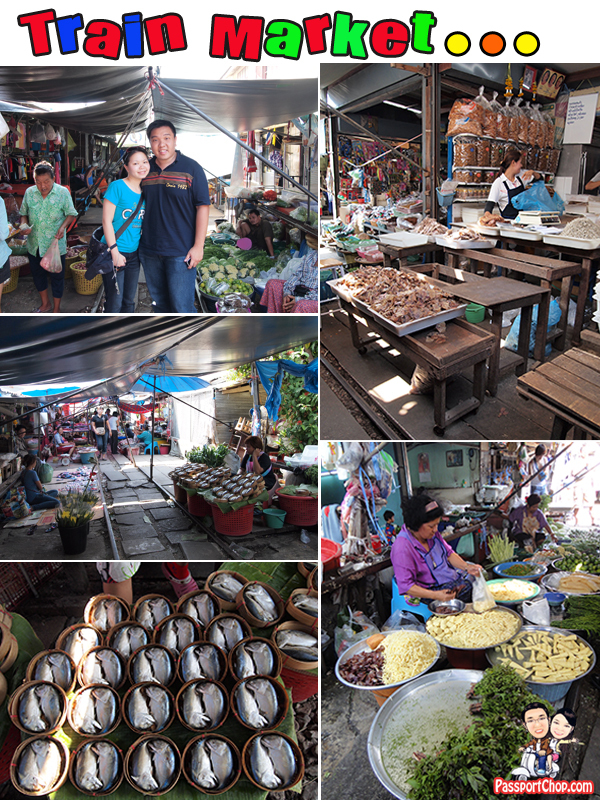 At Ban Laem walk through the market and at the street entrance, turn right. Keeping walking down this street for about 10 minutes and you will get to the station where you can take a train to go straight to Maeklong (1-hour long journey). Note that the timing of the trains on each side of the river do not match up. In some instances you may arrive as the train is pulling out of the station, while in others you may have to wait as long as two hours for the next train to arrive. When the train reaches the end of the railway line in Maeklong, you will have plenty of time (about an hour) to get off the train and explore the market before the train turns around again. Double-check with the train conductor on the last train timings so you don’t end up being stranded in Maeklong. This DIY trip to Maeklong Railway Market will cost less than 150 Baht. If you find all the train changing troublesome and don’t mind paying for a comfortable guided tour from Bangkok to Maeklong Railway Market and other attractions in the area e.g. Ampawa Floating Market, you can consider private tour services e.g. Rat Service – http://www.ratservice.com. For a half day private tour of Samut Songkram area which includes the Maeklong Railway Market, Ampawa Floating Market and 2 other beautiful temples, we paid about 2000 Baht for a driver/guide (hourly rate – about 250 Baht/hour), gasoline for the car (Toyota Corolla 1.6) and expressway tolls. The fee is charged at a per car rate so you could share the costs with 3 other friends, making it an affordable and convenient way to tour the area comfortably. Our tour was organised by Vimonrat (can call her Rat) and she is contactable at [email protected] (Tell her that PassportChop.com referred you). Our guide was friendly and knowledgeable in the area – what’s most surprising is that guests are provided with cold mineral water (stored in a cooler in the trunk) – a perfect respite especially after a hot day walking around Maeklong Railway Market. Maeklong Railway Market is a very unique place and can be only found in Thailand. Hi, I would like to know if it is very far to travel from Pratunam center? Can I go Maeklong Market by a taxi? yes very far – you might have to book a taxi for a half-day tour – you can consider using Rat Service for this tour. Thanks for the info. I am in the process of doing research for our honeymoon. How many hours was the half day tour? Rat Service – http://www.ratservice.com. For a half day private tour of Samut Songkram area which includes the Maeklong Railway Market, Ampawa Floating Market and 2 other beautiful temples, we paid about 2000 Baht for a driver/guide (hourly rate – about 250 Baht/hour), gasoline for the car (Toyota Corolla 1.6) and expressway tolls. The fee is charged at a per car rate so you could share the costs with 3 other friends, making it an affordable and convenient way to tour the area comfortably. Thanks for the info. I was actually asking how many hours the half day tour was. But I contacted Rat for more info. Thank you again. thank for the info and i will be visiting bangkok in a few days. My wife is very interest to visit this market place. Useful tips and I will try to bring her there. thanks for the info. Btw, is that we only able to check the timetable and purchase train ticket on the spot at train station? not available online? Sorry – i am not sure abt this.